This accomplished debut feature in gorgeous black-and-white, from U.S.-based writer-director Ana Lily Amirpour, is set in Bad City — which looks like a contemporary U.S. industrial town with some Western undercurrents and a dash of Frank Miller’s Sin City, though everyone speaks Farsi and an actual vampire roams the street at night. Beguiling in its strangeness, yet also effortlessly evoking recognizable emotions such as loneliness and the feeling of being stuck in a dead-end town and life, this moody and gorgeous film is finally more about atmosphere and emotions than narrative — and none the worse for it. “Middle Eastern feminist vampire romance” is likely to remain an underpopulated cinematic subgenre, but at least it now has a luminous standard-bearer in A Girl Walks Home Alone at Night. 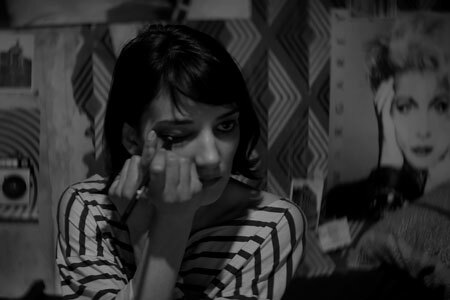 A sly, slinky creeper set in an imaginary Iranian underworld — appropriately realized in glistening black and white — U.S.-based writer-director Ana Lily Amirpour’s auspicious debut feature spices its genre stew with elements of Lynchian neo-noir and even spaghetti Western, but the film’s pointed, contemporary gender politics are very much its own. Whether she’s framing a static landscape or a close-up of someone gyrating to some infectious bit of Farsi pop, Amirpour invests each shot of her film with precision and wonder. There’s a bit of Eraserhead in here, and some early Jim Jarmusch: The story may be spare and familiar, but the characters’ submersion invests each moment with an oblique mystery. Look at Sheila Vand’s eyes, and how they seem to hover forever between pleading and assertive; that conveys more than reams of character exposition ever will. Look at the hesitation with which she and Arash approach each other. Or the grim, nostalgic reverie in which Arash’s strung-out, deadbeat widower father wallows, seeking a narcotic cocoon that’s both pathetic and touching. In a movie like this, glances, spaces, and movement mean more than dialogue or plot. We experience A Girl Walks Home Alone at Night through its surfaces. But if that’s not the essence of cinema, I don’t know what is.